Geese are seemingly innocuous birds, but there have been some interesting and well-documented principles that can be learned from them, especially from their migratory flying patterns. This information has been used many times and has been attributed to Dr. Robert McNeish, who first used it in a sermon he delivered in the early 70’s. 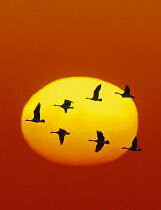 As each goose flaps its wings it creates an “uplift” for the birds that follows. By flying in a V formation, the whole flock adds 71% greater flying range than if each bird flew alone. We too are meant to be in community and are more effective when working in a team with others. Finding a group of like-minded people to journey with through life can be rewarding and energising. When a goose falls out of formation, it suddenly feels the drag and resistance of flying alone. It quickly moves back into formation to take advantage of the lifting power of the bird in front of it. This is where geese are possibly brighter than humans as we can often take while to realise that it’s difficult to fly alone and waste a lot of energy trying to go our own way. Sharing responsibility and delegating tasks can sustain leaders and keep the entire group on track. If you’re a leader and feel tired, why not allow others to take more on, giving you the chance to take a deep breath, re-energise and stay in the game rather than burn out. This one’s my favourite as it shows the value of encouragement. Positive affirmations and encouraging words can make a huge difference in a team environment. Even great leaders need to know that they are on track occasionally, so don’t be afraid to cheer them on. When a goose gets sick, wounded or shot down, two geese drop out of formation and follow it down to help and protect it. They stay with it until it dies or is able to fly again. Then they launch out with another formation or catch up with the flock. Unfortunately, in the busyness of our lives, we too often leave behind those who are wounded and hurting due to life’s circumstances. We would undoubtedly be a richer and more civilised community if more people stopped and waited with those who needed protection and company during their low points. Which point is your favourite? Next post – Do You Want the Ball? Thanks Darren, This is a WOW!!!!!!!!!!!!!! Thanks Annette, tell your friends! classic tale which I believe Erik K Grimes also draws upon in his book. Thanks, I agree it is a classic tale.